The Economist magazine includes an article (click here) this week about the potential for clean energy development fueled by wind turbines to aid the Dakota tribes. There's no doubt about it, as the article points out, one resource that is plentiful out on the plains is wind. 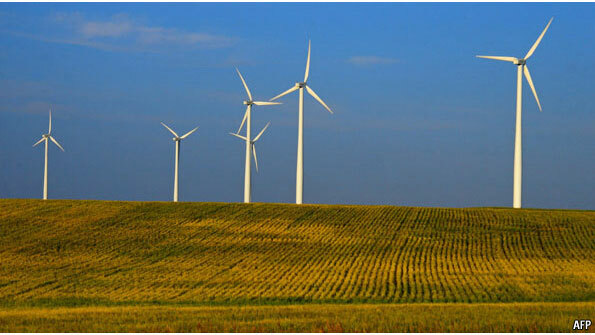 Setting up wind farms where multitudes of turbines would capture the prairie breezes to generate electricity is a fine idea. There are considerable hurdles, however, not the least of which are the difficulties of negotiating contracts in regions where tribal governance is beset both by chronic economic underdevelopment and the Federal government's heavy paternalistic hand. Another major technical difficulty is distance from population centers. There is no effective transmission network for moving electrical energy over long distances, and building one would be costly. Even if the distance of tribal areas from urban electrical consumers is an insurmountable problem, there still is merit in looking to wind power for meeting the electricity needs of tribal areas, not to mention the non-tribal towns that dot the Dakota landscape. Even if big wind farm development is impractical, smaller numbers of wind turbines could still meet much of the electrical needs of scattered rural communities.